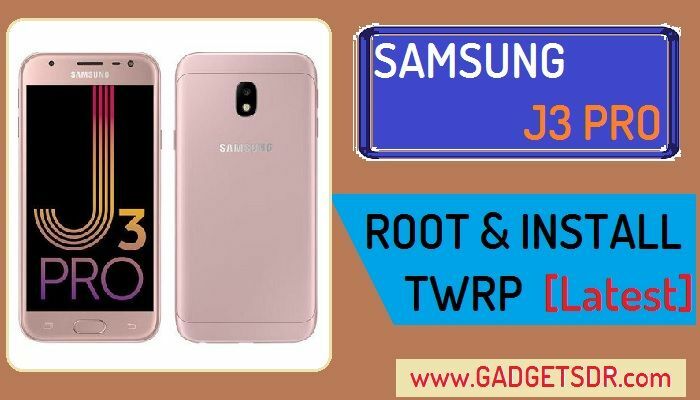 Root and Install TWRP Samsung Galaxy J3 Pro (SM-J330F, SM-J330G, SM-J330FN), Good news for you guys now you can easily Root and install TWRP recovery Samsung J3 Pro (SM-J330F, SM-J330G, SM-J330FN), If you want to customize your Android device, then you need to root your device first, before you root your Samsung J3 Pro, root void your device warranty, Root and install TWRP Recovery you need to follow below all steps very carefully. To Root and Install TWRP Galaxy J3 Pro you need to download some files. All downloadable files and guide on below. Note:- This method is successfully applied to Samsung Galaxy J3 Pro (SM-J330F, SM-J330G, SM-J330FN). If you want to unlock network from Samsung J3 Pro you need to root your device first, If you already root your device then you can skip the root steps and starts only from Unlock network steps, If your Samsung J3 Pro is unrooted, then you need to follow each and every step to unlock network Samsung J3 Pro (SM-J330F, SM-J330G, SM-J330FN). -First, Download SF_Root_File.zip and No Verify File for Samsung J3 Pro. -Then enable USB Debugging to your Samsung J3 Pro. -Once downloading finished, Open the downloaded folder then copy downloaded files to the desktop. -After that, Click on “AP” tab and give the file path from the extracted TWRP recovery file folder. -After that, click on “Start” button to install TWRP Samsung J3 Pro. -Now we need to install Super Su file to Root Samsung Galaxy J3 Pro. -Then select the “No Verify File.zip“. -Once installation finishes tap on the back button. -After that, tap on the “SF_Root_File.zip” then install the “SF_Root_File.zip”. -Now Swipe to confirm the install “SF_Root_File.zip“. -Done, now you have successfully Root and Install TWRP Samsung Galaxy J3 Pro. Thanks for visiting us, Comment below if you face any problem With Root and Install TWRP Samsung Galaxy J3 Pro, we will try to solve your problem as soon as possible. you can check other some tutorial here to help you.